Depending on conditions we may or may not use glacial terrain for the training. If you don't have any of the above equipment, e mail us in advance and we will provide spares. NB If you want to borrow equipment, please annotate this on your booking form under "remarks". and go home sweaty ! A great course and highly recommended for all skiers who venture onto glaciers. Miles, our guide, gave us an essential and very simple set of practical and life saving skills. 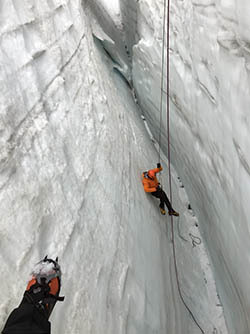 A freezing cold day with poor visibility - time extremely well spent hanging from a rope in a crevasse! Thanks Miles!! As a non-climber, it was extremely useful to learn proper rope technique and understand traction-and-pulley-systems in the context of a rescue. You start with the basic concepts of a rescue (both a self-rescue and rescuing someone who's in a hole) using basic simple equipment, moving on to look at different gadgets and techniques available to help. The hands-on practice all the way through was invaluable in getting these skills thoroughly ingrained. Highly recommended. No amount of reading up in textbooks or practicing on banisters will make up for a day getting your hands dirty (well, actually, icy). This course is extremely well structured, starting with the theory and moving in progressively harder practical stages to as close to the real thing as is safe or practical. Stuart is a natural communicator, who imparts his considerable knowledge and experience effectively and with humour. Highly recommended. Excellent course, very professionally run. I was a novice on rope technique for both self rescue and also rescuing victims. The course takes you through traditional rope methods to using the latest gadgets to aid rescue. I cannot recommend this course highly enough for anyone venturing on glacial terrain.